The Bharat Mata Mandir or Temple of Mother India is a unique eight-storied temple located in Sapt Sarovar near ashram at Haridwar, in Uttarakhand, India. 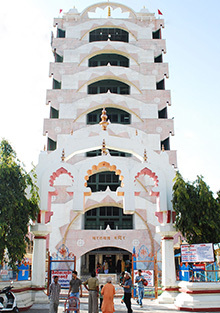 Founded by Swami Satyamitranand Giri, this religious shrine was established in 1983. Th temple is approximate 180 feet height and each storey of the temple is based on a particular theme, housing figures of many mythological legends, religious deities, freedom fighters and leaders. Elevators are installed in the temple to aid the pilgrims. Floor Six – Vishnu Mandir with Avatars – dedicated to all the incarnations and forms of Lord Vishnu including Ram, Krishna and Matsya. Floor Seven – The Lord Shiva and Kailas – Dedicated to Mahadeva, the floor offers a splendid view of the Himalayas and the whole complex of Sapt Sarovar. The Bharat Mata temple is well connected with various transports available such as buses, rickshaws or taxis.